As settlers to Silverton Country blazed their way through untouched timber, medical pioneers worked through uncharted waters to provide the best possible care to these and all of its people. Silverton Hospital, now Legacy Silverton Medical Center, celebrates its 100-year anniversary July 18. Hospital President Sarah Fronza said the spirit that got us here differs little from what it will take to navigate the next century. Though earlier attempts to form a hospital in Silverton fizzled out, the advent of its robust timber industry and the resultant accidents made it a necessity. In fact, it was Silverton Lumber Co,, founded in 1906, and Silver Falls Timber Co., started in 1914, that hired 36-year-old Clarence Keene, M.D., as “mill doctor” that same year. The timber company’s ability to lay miles and miles of track from Southern Pacific Railroad into virgin forests above the Abiqua brought a massive influx of men and families seeking work in the woods or at the mill. Horrific accidents, gruesome injuries and death were frequent occurrences among these largely inexperienced workers. “Old Pills and Iodine” was excited about the new challenge but needed a place to treat his patients locally. 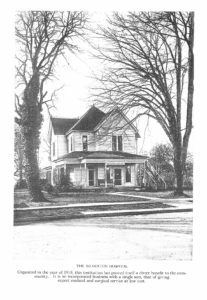 He purchased a large home on East Hill to serve as both mill hospital and home for the Keene family and graciously made the facility available to any doctor who needed it. After four years the place couldn’t handle the patient load and Dr. Keene was among the first to invest in a public hospital through the newly formed Silverton Hospital Association. The association purchased a large residence at 1103 N. Water St., and there the hospital was in operation from 1918-1937. As at the Keene home, surgical patients were transported up and down a flight of stairs by stretcher for better natural daylight and where remedies of the day – turpentine compresses, whiskey and a vast array of enemas – could be carried out in greater comfort. By the late 1930s the facility was literally creaking and groaning under ever-increasing demands. As they started raising money to add a wing, the sudden death of Rebecca Stevens Mount led to her son, an Oregon City physician, offering the spacious family home on a beautiful parcel on West Hill to the Silverton Hospital Association. They purchased it in July 1936 for $3,000; and though the property remains at the core of Silverton’s hospital complex, every ensuing decade ushered in dramatic additions and improvements. The 1940s and ‘50s saw construction of a new maternity wing, a medical-surgical wing, a kitchen-dining facility and the establishment of the Silverton Hospital Auxiliary, which remains an integral source of support to the hospital. By 1974 a new wing to house a lab, X-ray and business offices was completed and during the ‘80s respiratory, mammography and ultrasound technologies came to town. Soon after, an emergency room, and by the 1990s a $1 million campaign for an all-new facility was well under way. for expectant moms well outside the Silverton area. Today Legacy Silverton has clinics in Woodburn, Keizer and Mount Angel and a multitude of relationships with private doctors and clinics. Silverton Hospital became part of the Legacy Health organization in 2016. Legacy Health has also pledged to match the $1 million Silverton Health Foundation is raising for its Campus Enhancement Project. Foundation Director Randy Stockdale said the project includes new emergency and imaging facilities, a rooftop helipad and an outpatient clinic with underground parking. The foundation has raised nearly $300,000 since launching its campaign in May. Though plans are only in a conceptual stage, Fronza expects they’ll break ground in three years. This summer Legacy Silverton Medical Center will hold many events to celebrate the hospital’s 100-year anniversary. One of the first is its participation in this year’s Homer Davenport Community Festival. In addition to having its own couch in the Davenport races, the hospital will give away 100 passes to the pool and 100 bike helmets, fitted by specialists. Dr. Olwyn Davies, who has practiced medicine more than 60 years, will be Grand Marshal of the festival parade.